This 5K course has a variety of surfaces including asphalt, brick, boardwalk, crushed rock, and grass. There is a combination of up hills, down hills, tight turns and flat stretches throughout the course. Native Michigan woodlands are in abundance along with a wide variety of zoo animals to catch your eye. Highlights also include panoramic views of the African savanna with herds of giraffe, zebra, antelope, lions and more. This is a truly unique venue for a 5K event. 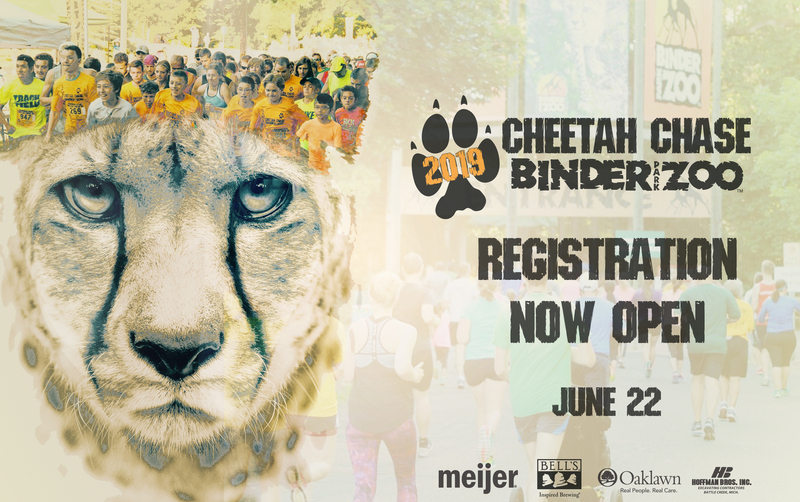 Pre-register online at www.binderparkzoo.org/5k or complete a registration form to enter the Binder Park Zoo Cheetah Chase event of your choice. Online registration will close at 11:59pm EST on Thursday, June 20, 2019. Mail-in registrations must be postmarked no later than June 17, 2019. Day of event registrations will be accepted for the race fee of $50. Reduce your time in line with early packet pick-up. From 4pm to 6pm on Friday, June 21, we will have early packet pick-up in the Cross Administration Building (Zoo Office). Participants may also register on Friday during Friday packet pickup. 6:45am to 7:45am - Registration. 7:30am - Gates to zoo entrance closed to prep for race - be here before 7:30 to park in zoo lot. 8:00am - Gazelle Gallop (5K Run), Sloth Walk (5K Walk). Post Race Cool Down After The Race. Last participant must cross the finish line by 9:30am. Shuttles from Harper Creek High School will run from 6:00am until 11:00am. All participants in both 5K events will receive a free day-of admission pass to the zoo and their first Bell’s brew for free (21 and up only). Race day registrations are not guaranteed Cheetah Chase shirt. The $40 registration fee includes a Cheetah Chase Technical Tee Shirt. 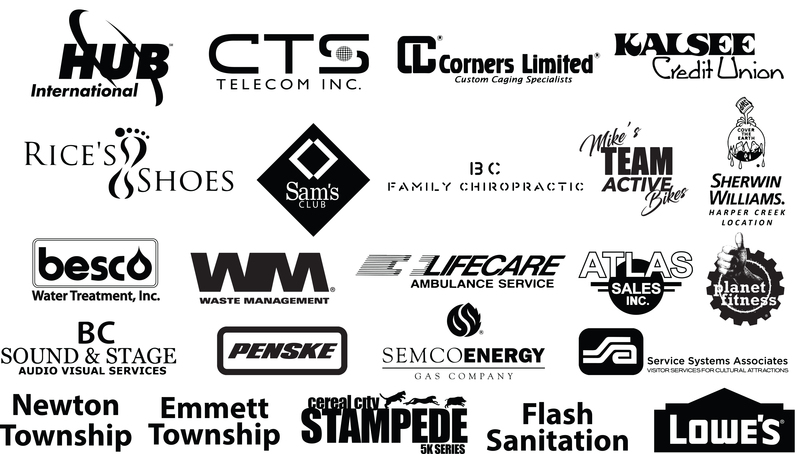 Kalamazoo Area Runners/Battle Creek Road Runners and Holland Area Runners receive a $5 discount with your membership ID number. Registration fee includes - Registration, “technical” race shirt, zoo pass for the day, and first beer free at the Beverage Sponsor station for adults over 21 years of age. Prizes for the Gazelle Gallop and Sloth Walk will be awarded to: 1) Top Overall Male, 2) Top Overall Female, 3) Top Master Male & Female, 4) Top Three Males and Females per Age Category. Top overall male and female master excluded from age category awards. Results will be posted following the completion of each event on site and later in the day at www.macssportstiming.com. Results can also be accessed on the Monday following the race at www.binderparkzoo.org/5k. Gazelle Gallop and Sloth Walk timing provided by Mac's Sports Timing. Go to www.macssportstiming.com for results. This special overnight experience is open to Cheetah Chase participants and their cheering section. Eat a spaghetti dinner, explore the zoo at night, and wake up to morning yoga before heading down to the starting line. One valid Cheetah Chase confirmation number is required to register for this Slumber Party date. 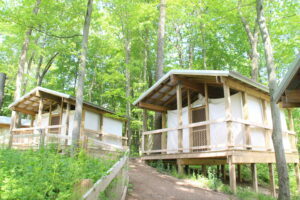 $240 for up to 4 people and $50 per extra person for up to 8 people total in each tent. Members receive 10% off.